That means running efficiently, saving on maintenance costs, limiting downtime, and maximising productivity. Sound good? 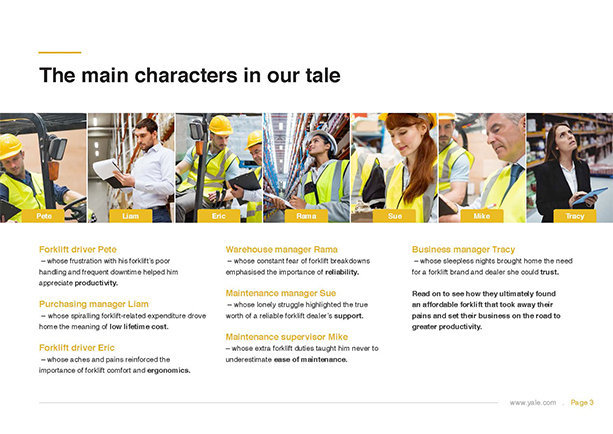 Discover the forklift truck attributes vital to materials handling productivity, as seen through the eyes of a fictional company. Find out how productivity is affected by control, visibility and operator comfort. Read about the importance of trust between business manager and dealer, making all the difference to how she feels about her fleet. Learn how ease of access to key components and useful information shown on the driver’s LCD panel makes daily checks a breeze. Ease of maintenance brings together man and machine. Fluid reservoirs and other components included in routine checking by drivers can be reached in moments, allowing materials handling to start with minimal delay. Because its components and systems are hard-wearing and well designed, they require less frequent maintenance. This pushes the planned service intervals further apart. A wide-opening engine cover and other access features allow service engineers to reach components quickly, reducing the time taken for servicing procedures and repairs. By downloading our eGuide you have the option to enter into our competition to win a Car Chase Experience Day for you and your team. To enter into this competition simply tick the box at the bottom of this form and you and your team could be driving cars such as a Camaro SS, Corvette and a 1965 Mustang around the track*! 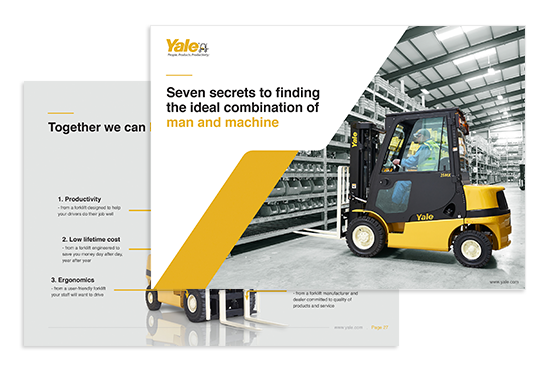 Every person that downloads our eGuide, ‘Seven Secrets To Finding The Ideal Combination Of Man and Machine’, will not only get their hands on a great read, they will also have the opportunity to enter an exclusive competition to WIN a Car Chase Experience Day courtesy of Yale. The Car Chase Heroes Triple Supercar Blast is available at any of these five locations: Abingdon (Oxfordshire), Bicester Heritage (Oxfordshire), Blyton Park (Lincolnshire), Throckmorton (Worcestershire) and Tockwith (York). The prize is for a team of eight people, meaning the winner will be allowed to take up to seven other participants. YYou and your team can take your pick of three cars from the impressive supercar fleet and take each one for three thrilling laps. 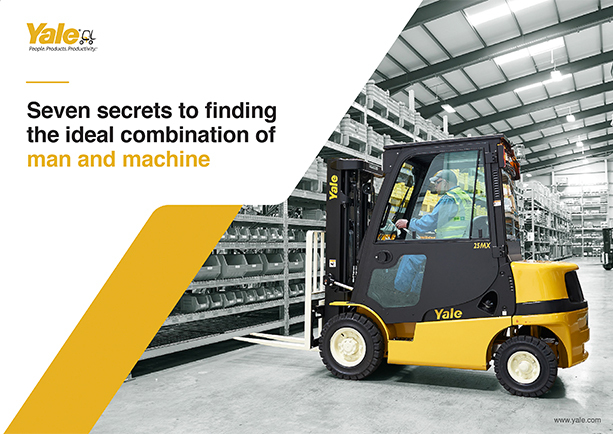 To enter, simply download our eGuide ‘Seven Secrets To Finding The Ideal Combination Of Man and Machine’ and submit your entry before Friday 28th April 2017, when the competition closes. The winner will be announced via email on Friday 12th May 2017. You do not need a driving licence to take part, however, you must be able to reach the pedals with the padding we provide. All cars are not available on all days. Cars need maintenance and some have other racing commitments so always check that your desired car is available on your chosen date. If your experience is cancelled due to bad weather or unforeseen circumstances, you will be allocated a new date. This promotion is open to UK residents who are aged 18 years and over. Proof of age may be required before a prize-winner can claim a prize. The winner and their guests must be aged 18+ to access the venues. The prize draw entry will close at 23:59 GMT on Friday 28th April 2017. Hyster-Yale UK Limited accepts no responsibility for entries not successfully completed due to a technical fault technical malfunction, computer hardware or software failure, satellite, network or server failure of any kind. Participants are deemed to have accepted and agreed to be bound by these terms and conditions upon entry. Hyster-Yale UK Limited reserves the right to refuse entry, or refuse to award the prize to anyone in breach of these terms and conditions. The prize is supplied by Blendini MS Limited, Unit A1, Knights Court, St. David's Ind Est, Pengam, Blackwood, NP12 3SW (“the Supplier”). Hyster-Yale UK Limited reserves the right to replace the prize with an alternative prize of equal or higher value if circumstances beyond Hyster-Yale UK Limited’s control makes it necessary to do so. The winner will be drawn on Friday 5th May 2017. The winner will be selected in a random draw and will be contacted within seven working days of Friday 5th May 2017. The winner must respond within 7 days after contact to accept the prize. Competitions are not open to employees (or members of their immediate families) of Hyster-Yale Group, Inc, or any of its subsidiary companies. Hyster-Yale UK Limited reserves the right to verify the eligibility of entrants. Hyster-Yale UK Limited may require such information as it considers reasonably necessary for the purpose of verifying the eligibility of an entry and the prize may be withheld until and unless Hyster-Yale UK Limited is satisfied with the verification. 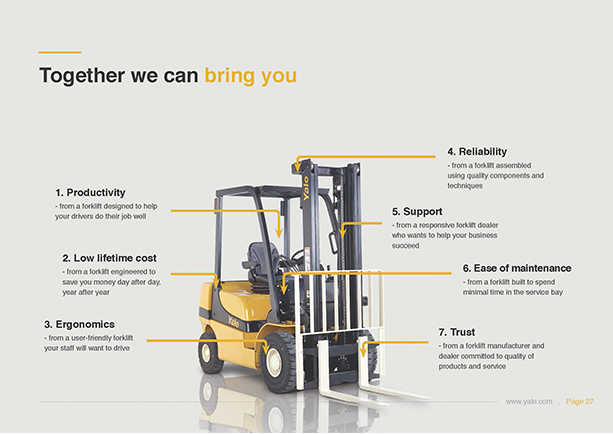 Hyster-Yale UK Limited reserves the right to amend these rules at any time. Hyster-Yale UK Limited may also create rules which will apply to a specific competition only. If we do this we will publish the amended competition rules and/or specific competition rules on the relevant competition page. The decision of Hyster-Yale UK Limited regarding any aspect of the prize draw is final and binding and no correspondence will be entered into about it. Hyster-Yale UK Limited reserves the right to hold void, cancel, suspend, or amend the promotion where it becomes necessary to do so. Insofar as is permitted by law, Hyster-Yale UK Limited, its agents or distributors will not in any circumstances be responsible or liable to compensate the winner or accept any liability for any loss, damage, personal injury or death occurring as a result of taking up the prize except where it is caused by the negligence of the Hyster-Yale UK Limited, its agents or distributors or that of their employees. Your statutory rights are not affected.